This is an overview of Limit Hold'em beginning with how to play the game and starting hands. Besides the basics, Krieger delves into some important strategic and psychological topics. If you're new to the game you this is a pretty comprehensive guide that I don't have a problem recommending. For the opening section, new players will become acquainted with the general rules of Hold'em and housecleaning on how to play the game. If you've already picked up the game, you can gloss over this section. Following that, you'll receive quality advice from Krieger on playing specific hands and have the opportunity to review hands. Perhaps one of the most valuable sections for beginners in this text is the starting hand standard graphic. If you're playing online, you can keep this next to your computer at limit ring games. This chart is color-coded and broken down into early, middle, and late position to help you even further. Instead of delving directly into strategy, Krieger does a good job of introducing beginners into the game. His writing style is easy to follow and he intersperses important psychological topics with actual gameplay advice. 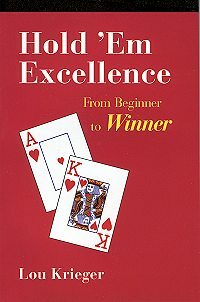 Overall, this is a strong overview on how to develop a strong game of hold'em.